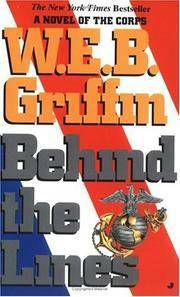 Behind the Lines is W. E. B. Griffin's powerful novel of World War II -- and the courage, patriotism, and sacrifice of those who fought it.By 1942, the Japanese have routed the outnumbered American forces and conquered the Philippines. But deep in the island jungles, the combat continues. Refusing to surrender, a renegade Army officer organizes a resistance force and vows to fight to the last man. A Marine leads his team on a mission through the heart of enemy territory.And the nation's proudest sons fight uncelebrated battles that will win -- or lose -- the war . . .
2014-04-04. New. Ships with Tracking Number! INTERNATIONAL WORLDWIDE Shipping available. Buy with confidence, excellent customer service! 1996-09-04. New. Ships with Tracking Number! INTERNATIONAL WORLDWIDE Shipping available. Buy with confidence, excellent customer service! 1996-02-07. New. Ships with Tracking Number! INTERNATIONAL WORLDWIDE Shipping available. Buy with confidence, excellent customer service! 2011-05-05. New. Ships with Tracking Number! INTERNATIONAL WORLDWIDE Shipping available. Buy with confidence, excellent customer service! G. P. Putnam's Sons. Collectible - Like New. First edition copy. Collectible - Like New. Like New dust jacket. 2005-04-08. Good. Ships with Tracking Number! INTERNATIONAL WORLDWIDE Shipping available. May not contain Access Codes or Supplements. May be ex-library. Shipping & Handling by region. Buy with confidence, excellent customer service! 2014-04-04. Good. Ships with Tracking Number! INTERNATIONAL WORLDWIDE Shipping available. May not contain Access Codes or Supplements. May be ex-library. Shipping & Handling by region. Buy with confidence, excellent customer service! 1996-06-01. Good. Ships with Tracking Number! INTERNATIONAL WORLDWIDE Shipping available. May not contain Access Codes or Supplements. May be ex-library. Shipping & Handling by region. Buy with confidence, excellent customer service! G K Hall & Co, 1996-06-01. Hardcover. Used:Good. G K Hall & Co. Hardcover. 0783817223 New Condition. . New. 2013-07-06. Good. Ships with Tracking Number! INTERNATIONAL WORLDWIDE Shipping available. May not contain Access Codes or Supplements. May be ex-library. Shipping & Handling by region. Buy with confidence, excellent customer service! Brilliance Audio, 2005. Compact Discs - VG - 15 CDs without defect - Unabridged - 18 hours.. Very Good. 1996-02-07. Good. Ships with Tracking Number! INTERNATIONAL WORLDWIDE Shipping available. May not contain Access Codes or Supplements. May be ex-library. Shipping & Handling by region. Buy with confidence, excellent customer service! 1996-09-04. Good. Ships with Tracking Number! INTERNATIONAL WORLDWIDE Shipping available. May not contain Access Codes or Supplements. May be ex-library. Shipping & Handling by region. Buy with confidence, excellent customer service! G K Hall & Co. Hardcover. 0783817223 Like New Condition. . Fine. E Rutherford, New Jersey, U.S.A.: Putnam Pub Group, 1996. Book. Very Good. Hardcover. Signed by Author(s). A Very Nice Copy - INSCRIBED TO PETE WARNIK - by the AUTHOR on the Title page. First edition, First printing, with the corresponding number line. Book is in Very Good condition. Boards are clean, not bumped. Fore edges have a small amount of shelf wear. Interior is clean and legible. Not remaindered. Dust Jacket is in Near Fine condition. Not chipped or crinkled. Not price clipped. Dust Jacket is covered by Mylar wrapper. Thanks and Enjoy..
G. P. Putnam's Sons,, 1995.. Hardback. Collectable, very good. 1st printing (full number line). Book and jacket in very good condition. Book cover like new; page edges very lightly soiled, no marks or writing. Dust jacket has very slight edgewear, now protected by clear archival mylar sleeve. **We provide professional service and individual attention to your order, daily shipments, and sturdy packaging. FREE TRACKING ON ALL SHIPMENTS WITHIN USA. Putnam Adult, 1996-01-03. Hardcover. Very Good. Nice looking book, has minor edge wear. Putnam Adult, 1996-01-03. Hardcover. Like New/Like New. 1995 First Edition, w/full number line. Hardcover w/l.n. dust jacket. Owner name on flyleaf. Otherwise as new, mint condition. From The Civil War Book Shop- As close as your computer; as dependable as old Abe. Brilliance Corp, 1996. Audio Cassette. Good. U.S.A.: Putnam Adult, 1996. Putnam Adult. As New in As New dust jacket. 1996. First Edition; First Printing. Hardcover.. Hard Cover. As New/As New. 8vo - over 7¾" - 9¾" tall. NEW YORK: G. P. PUTNAM'S SONS. VG/VG BOOK & DJ LIGHTLY EDGEWORN. DJ IN MYLAR. Pages: 435. . 1995. 1ST. HARDCOVER.. Condition: VG/VG BOOK & DJ LIGHTLY EDGEWORN. DJ IN MYLAR. Pages: 435. JOVE. New. 6.69 x 4.12 cm. Putnam Adult, 1996-01-03. Hardcover. Used:Good. Jove, 1996-09-01. Mass Market Paperback. Used:Good. New York: G.P. Putnam's Sons, 1995. 435 pages. Book and Jacket appear to have hardly been read and are both in Fine condition throughout. . First Edition. Hard Cover. Fine/Fine. U.S.A.: Putnam Adult, 1996. very good hardcover with dust jacket. 1996. Hardcover. Very Good/Very Good. US: Putnam Adult. Hardcover. 0399140867 Very good in very good dust jacket. Later printing. books carefully packed and shipped promptly . Very Good. 1996-01-03. Grand Haven, Michigan, U.S.A.: Brilliance Audio, 1996 Audio Book. Soft Cover. Very Good. 12mo - over 6¾" - 7¾" tall. New York: Flame Tree Publishing, 2008. LED ZEPPELIN Revealed ~ Jason Draper. Flame Tree Publishing, 2008. Hardcover / Dustjacket. Photographic cover. VG+/VG+. 200 pages. Over 150 photographs. Measures 11 3/4" x 11 1/2." . Hard Cover. Very Good +/Very Good +. 4to - over 9¾" - 12" tall. Music. G.P. Putnam's Sons, New York, 1995 ISBN# 0-399-14086-7 First Edition, #7 of the Corps series. vg/vg, Dj lightly worn on edges. Book has stains on back board. 435 pages. Now protected in mylar cover.. F. Hardcover. Putnam Adult. Hardcover. 0399140867 . . New. 1996. Putnam Adult. Hardcover. 0399140867 Ships promptly from Texas. . New. 1996. Putnam Adult. Hardcover. 0399140867 Ships from Tennessee, usually the same or next day. . New. 1996. E Rutherford, New Jersey, U.S.A.: Putnam Pub Group, 1996. Book. Very Good+. Hardcover. 1st Edition. A Nice Reading Copy - First Edition, First Printing. Book Is In Very Good + Condition. Boards Are Clean, Not Bumped. Fore Edges Have A Small Amount Of Wear. Interior Is Clean And Legible. Not Remaindered. Dust Jacket Is In Very Good + Condition. Tiny Bit Of Shelf Wear/Rub. Tiniest Bit Of Wear Along The Edges. Not Price Clipped. Dust Jacket Is Covered By Mylar Wrapper. Thanks And Enjoy..
New York: G. P. Putnam's Sons, c1995. 4th printing. Hardcover. Very good condition in good d.j./good. 435p. New York: G. P. Putnam's Sons, 1995. First edition, First printing. So stated. With corresponding number line. Book is in Very Good condition. Boards are clean, not bumped. Fore edges have a small amount of reading wear. Interior is clean and legible. Not remaindered. Dust Jacket is in Near Fine condition. Not chipped or crinkled. Not price clipped. Is covered by mylar wrapper. A very good reading copy. All-ways well boxed, All-ways fast service. Thanks.. First Edition. Hard Cover. Very Good/Near Fine. G. P. Putnam's Sons. Good in Very Good dust jacket. 1995. First Edition. Hardcover. Book spine has a slant. .
U.K.: Severn House, 1996. Dark brown bds with gilt title to spine. Bump/rub to spine ends and corners. Creasing/slanting to spine. Usual library markings. Top corner crease to some pages. Creases to back free endpaper. Text Good ++. Unclipped dustjacket in clear protective sleeve with some creasing to jacket spine and edges. . Hard Cover. Good +/Very Good-. 8vo - over 7¾" - 9¾" tall. Ex-Library. Used; Very Good. Putnam Adult, 1996. Hardcover First Edition Book Condition: Very Good. Jacket Condition: Very Good. . 1995. First Edition. HARDCOVER. G.P. Putnam's Sons. MASS MARKET PAPERBACK. 0515119385 . New.